When we left Nosy Komba both the tide and the breeze were going our way. We cheerfully tucked into the line of sail-driven workboats. We now seemed to be less a cause of merriment, perhaps because we were no longer trying to go up the down escalator. The dhows flew their sails horizontally to catch the following wind and often edged past us, which produced plenty of big smiles. I thought it instructive that a vessel of ancient design—carrying a cargo of sand and crushed rock at that!—could be more efficient than a modern cruising boat. On the way to Baramahamay Bay we needed to round a 300-foot basalt core, where our course changed about 90 degrees. We reverted to old form and started bucking the current here, although this time we could plead the plausible excuse of wanting to negotiate the bay in favorable light. Ahead of us we saw a dhow tacking, something I’d never witnessed before. The problem with tacking a lateen rig is that the yard must be shifted to the opposite side of the mast, which with sisal lines, no winches and a powerful sail, is hard to accomplish. As I watched, the helmsman bore off and began to slowly wear ship (instead of turning through the wind to tack, he would instead make a full loop to leeward). When the boat was sailing almost dead downwind the sheet was let go and the sheet, sail and yard all blew off before the mast, which is why it is stepped leaning forward. The sheet was then recaptured and all was brought in on the other side of the mast. Before the boat headed up onto the new tack the crewman got the sail sheeted home, a task he couldn’t have managed if the sail had been allowed to fill. And I thought a spinnaker gybe with six guys on winches was impressive! Amazingly, the pot of rice cooking in the sandbox aft was never in jeopardy. One afternoon Irene and I were sitting ashore in Baramahamay playing cards and drinking beer with a Californian crew. From time to time I looked up from my hand to follow the progress of a pirogue as it tacked up the bay. Pirogues carry a square sail that would just about cover a queen-size bed. The sail is held aloft by its upper corners on two light poles; the lower corners are tacked to the outboard ends of the forward pole that holds the outrigger. The performance is spectacular; off the wind these narrow pirogues can sail at 10 knots. The problem of sailing upwind with a square sail has an equally elegant solution. Instead of setting the two poles athwartships like rabbit ears, they are oriented with one forward and one aft. These boats sail quite close to the wind in this fashion, and on some of the larger ones a crewmember has to sit out on the windward outrigger pole to act as counterweight. I’ve seen pirogues racing upwind so fast that their wakes rose into rooster tails. Our pirogue fetched the beach and rounded up head-to-wind as the poles were dropped. With a terrible squeal a trussed-up wild pig was dragged ashore, and Irene, with a vegetarian’s instinct, fled on a photo tour of the farthest reaches of the village. The animal was dispatched with a whack to the head and within half an hour was ready to be shared among various families. 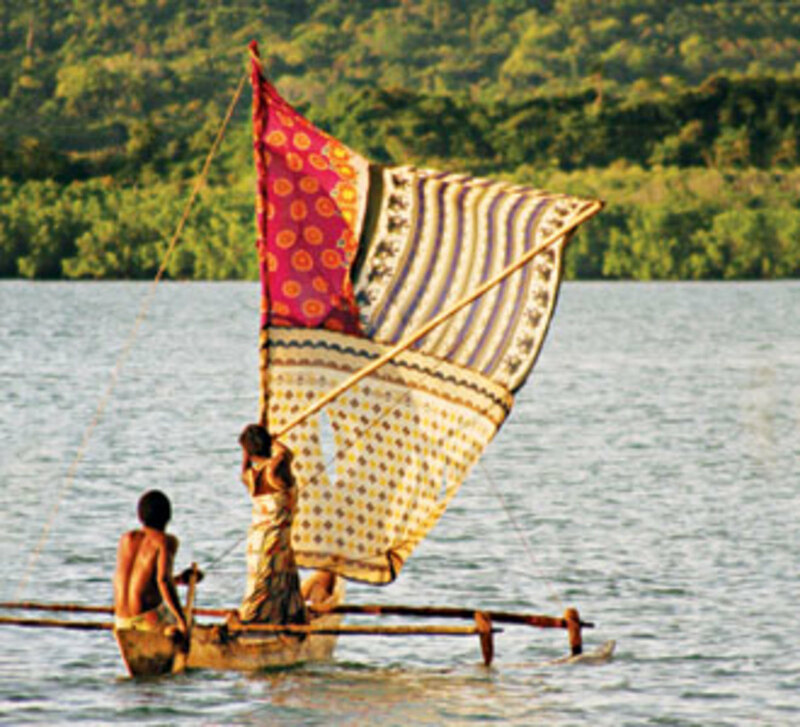 As we watched—by now Irene had cautiously returned—a pair of waist-high children heaved their family’s share into a tiny and decrepit pirogue and, after raising a sail made from an opened rice sack, set off across the bay. We heard them chattering happily until the wind drowned out their small voices. I knew then how much respect I had for the watermen and sailors of Madagascar.